Yao Ming for Yang-Sing Beer! Yao Ming has been very busy recently, learning about American culture as well as how to play center in the NBA. But he must have a little extra time on his hands because he is the brand new spokesman for Yang-Sing Beer. Murray in the Morning has obtained an audio version of Yao's new promotional campaign. In light of the attack on Kansas City coach Tom Gamboa during a Royals-White Sox baseball game (pictured to the left), MitM has flipped the switch and became a world-class news-gathering organization. Here is MitM's Nightline spin on the recent events at Comiskey Park, including exclusive interviews with the attackers themselves, William Ligue Jr. and his son. In honor of Labor Day, and the fact that Major League Baseball averted it's ninth work stoppage over the weekend... several celebrities joined the MitM crew on Monday to celebrate the grand old game of baseball! Yao Ming's rendition of "Casey at the Bat"
Nate Newton and Ted Koppel's rendition of John Fogerty's "Centerfield"
The Osbournes' rendition of Abbott and Costello's "Who's on First"
Listener: "I think I'm entitled.."
Listener: "I want the parodies." 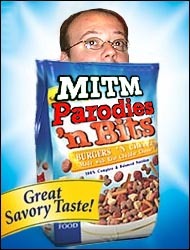 MitM: "YOU CAN'T HANDLE THE PARODIES!"